To facilitate exchanges and synergies among European and French software vendors, security services companies, system integrators, users and the whole ecosystem of information security, cloud confidence and cybersecurity. To facilitate the emergence of common marketing and business enterprises. To promote the best practices in the fields of cloud confidence and cybersecurity and to build awerness towards the current regulations in France and in Europe regarding our activities. 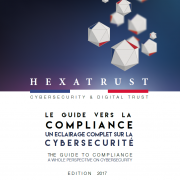 To develop and promote the HEXATRUST label by creating a reference framework allowing solutions users to resort to cloud and cybersecurity expertise available within the cluster and structured through a comprehensive portfolio. To elaborate several evaluation and certification schemes in cloud confidence and cybersecurity or a code of conduct, including evaluation and certification regulations and framework with a list of mandated organisms. To act accordingly with private and public representative organisms in France and Europe to insure the safeguard of our members’ interests.